TAS Rights ManagementAfter months of anticipation, Taylor Swift’s Reputation stadium tour kicks off tonight in Glendale, AZ. But Swifties aren’t going into the experience blind: Thanks to Taylor’s frequent reveals on her Instagram Story, fans already know quite a bit about what to expect from the pop extravaganza. And as long as we’re talking numbers, Taylor’s revealed that she’ll have eight costume changes, three stages — one of which is 110 feet tall — and seven different mics, including a rose gold one, a sparkly green one and one with a big gold snake on the front. Snakes have been a recurring motif of Reputation-era Taylor, and the theme continues in the tour’s meet-and-greet area, the “Rep Room.” The column holding up the roof is decorated with a snake sculpture, and there’s a poster of the movie Cleopatra, about the Egyptian queen who died from a snakebite. Snakes are also a motif on the new collection of merch you’ll be able to buy at each tour stop. During the show, Taylor will play piano on two songs — one of which is likely “New Year’s Day” — and she’ll traverse the length of the stadium in a “rocket sled” that will travel underneath the stages, allowing her to pop out unexpectedly in different areas. 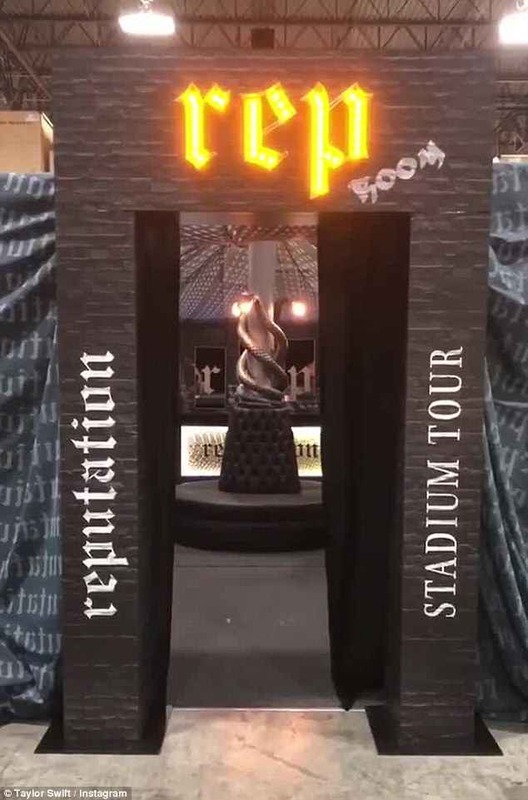 When the show ends, fans will be showered in confetti in the shape of mini-Reputation newspapers, and a “blooper reel” will play as they file out of the stadium. The first leg of Reputation tour, with Camila Cabello and Charli XCX as opening acts, wraps in October.